A couple of weeks ago, I pulled all our onions (two tires' worth). This was the same day I picked the pears, so I just piled the onions on top of the fruit. 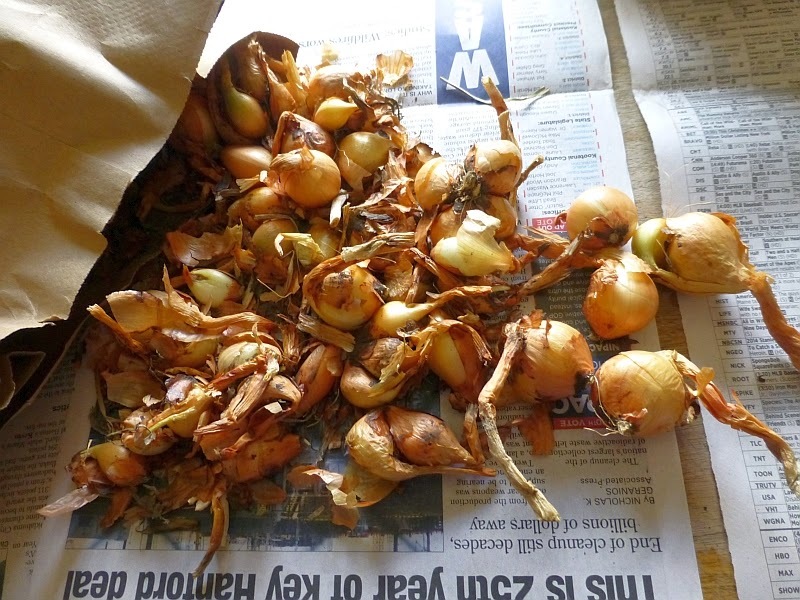 I grew both yellow and white onions from sets. 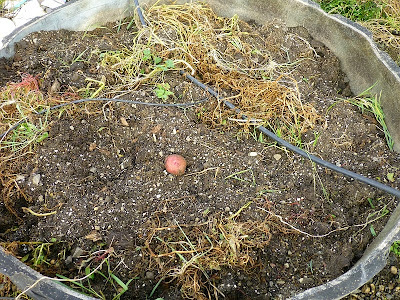 I parked the wheelbarrow by the door and pulled out the pears but left the onions. The chickens, of course, had to investigate. ...gradually working my way through the lot of them. I took all the onion tops, trimmed off anything that was withered or brown, and stacked them neatly in a crate. The debris went into the compost pile. ...which weighed in at about 25 lbs. I didn't want to waste the onion tops, so I decided to dehydrate them. After chopping, they filled two large bowls. I spread them in layers in our $6 thrift-store dehydrator. They dried in about 18 hrs. Because I had so many onion greens to dry, it took about four days to work through them. They came out of the dehydrator crispy. Younger Daughter tried one out as an "onion ring." I also had some larger onion chunks I didn't chop up. Instead I put those in the fridge for immediate use. Total came to a gallon and a half of dried onion greens. These will be excellent in soups and stews. Meanwhile, while all this was going on, I was in communication with a reader in southern Idaho who asked to remain unnamed (I'll call him "John" for convenience' sake). 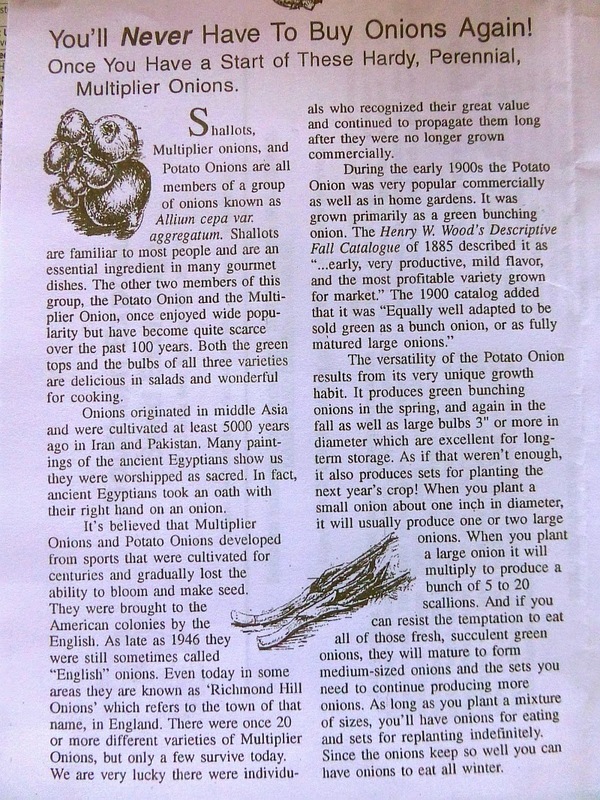 In reference to my earlier blog post on how onion sets were formed, John asked if I'd ever heard of potato onions, also called multiplier onions. In investigating this variety, I am astounded -- flabbergasted -- bowled over -- that I had literally never heard of them before. 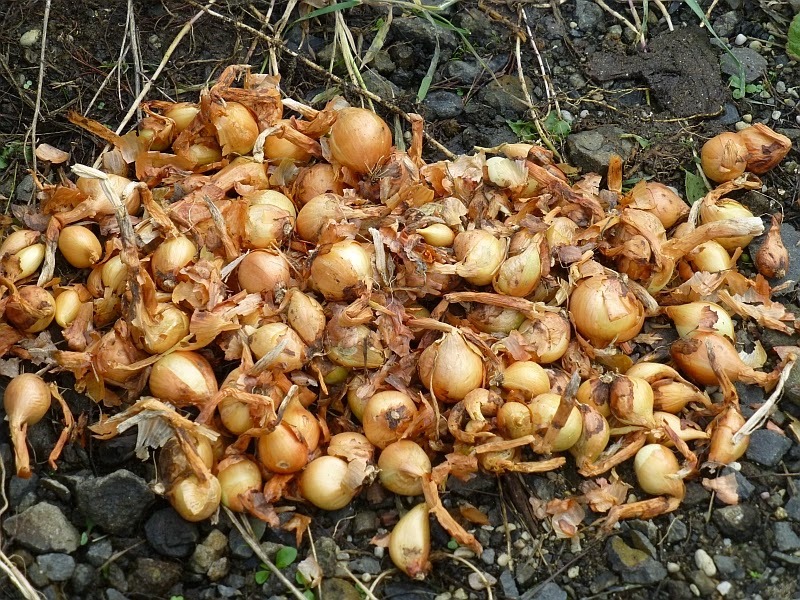 Potato onions are treated much like garlic -- planted in the fall and producing multiple bulbs by the following summer. They are known for how long they store. 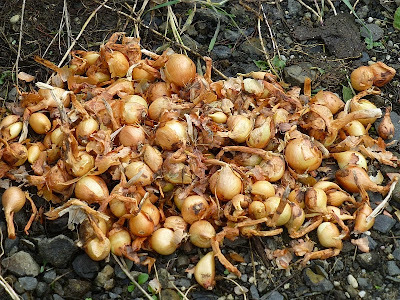 The Wikipedia page states, "It is remarkably easy to grow, keeps better than almost any other variety of onion, and is ideal for the home gardener with restricted space. It was very popular in the past, but -- like many old varieties -- it has been passed over in favor of types more suitable for mechanical harvesting and mass marketing." 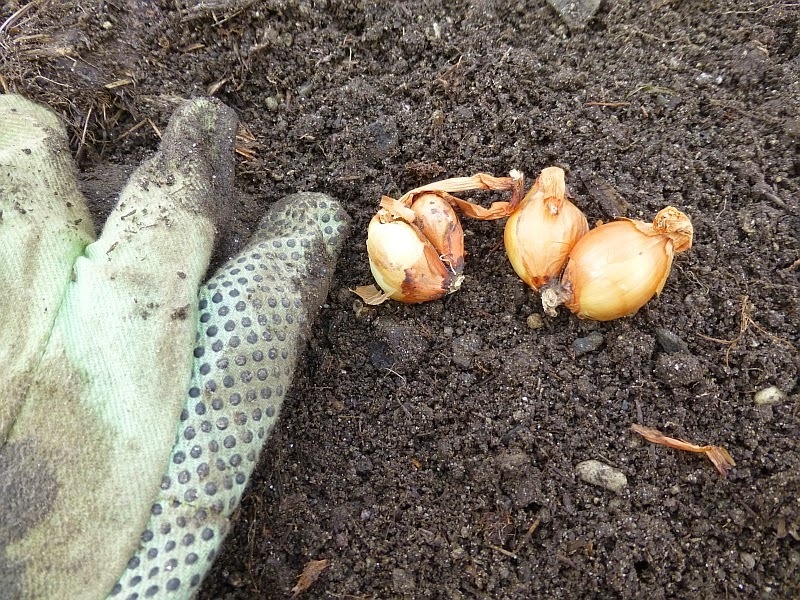 Interestingly, planting a small bulb produces a larger onion; and planting a large bulb produces multiple smaller onions. 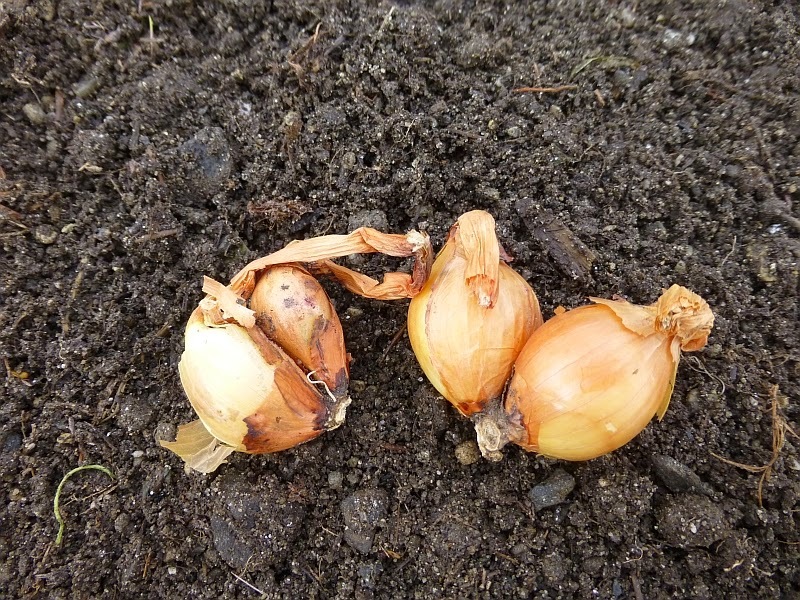 Unlike regular onions where you have to fuss with seeds or sets, these are as easy as garlic to propagate. In short, this sounded like the onion for me. 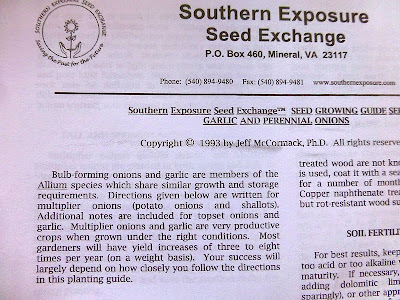 John kindly offered to send me some of his surplus crop and I jumped at the offer (and sent him a copy of my book in exchange). John sent about a pound. The bulbs aren't terribly big. 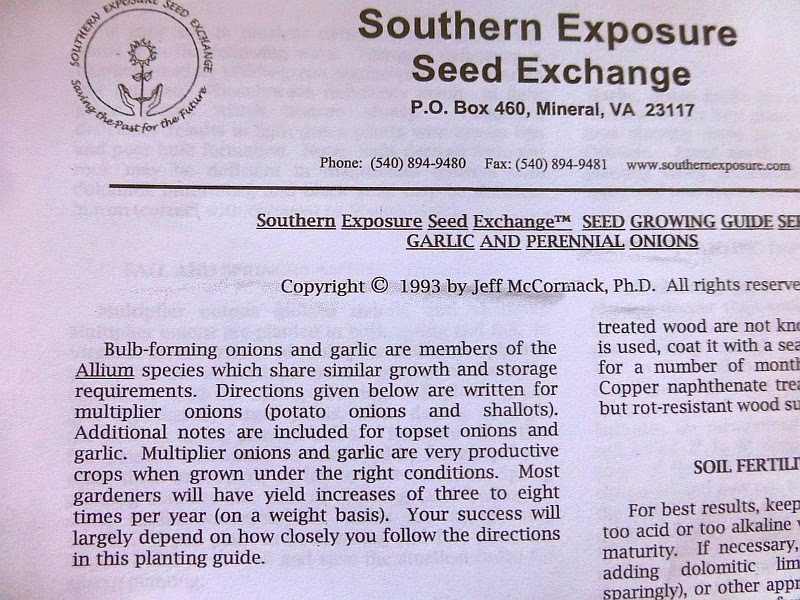 John also sent some accompanying literature to introduce me to this remarkable allium. I decided to plant them in some of the now-vacant potato tires. 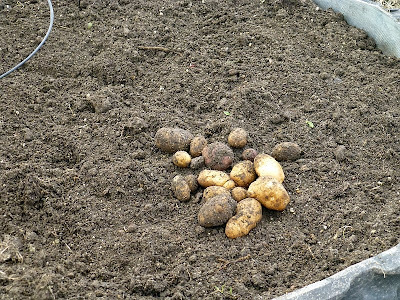 I needed to clean them up anyway, after harvesting the taters. 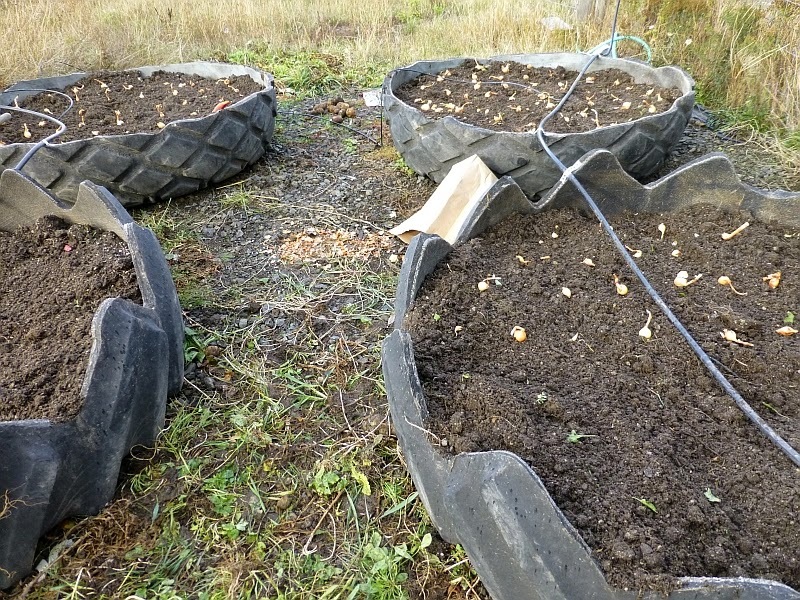 I dug out all the weeds, removed the drip system (which needs to be removed before the snow falls anyway), and otherwise cleaned up the beds. I wasn't sure how many beds I'd need, so I cleaned up four. 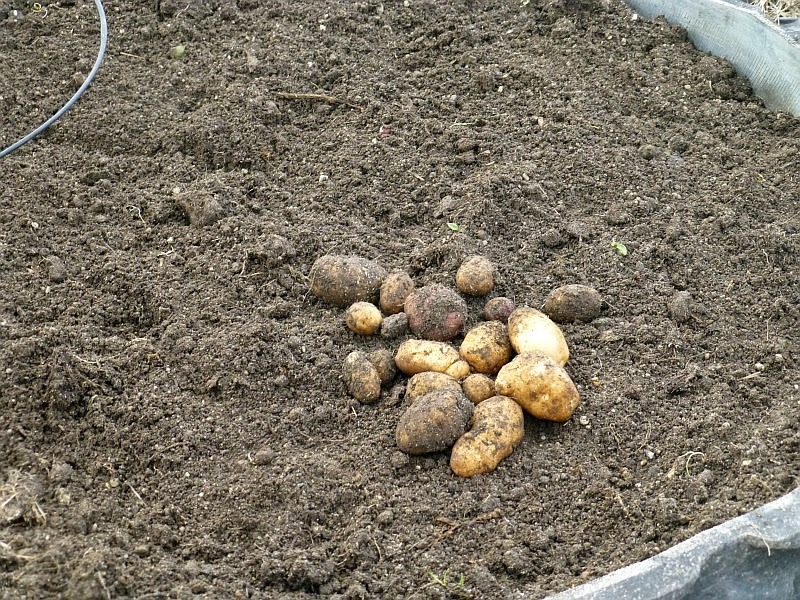 It was inevitable that I'd find some potatoes we'd missed. Then I pulled out the onions. You can see how they form "cloves." The gloves show the relative size. 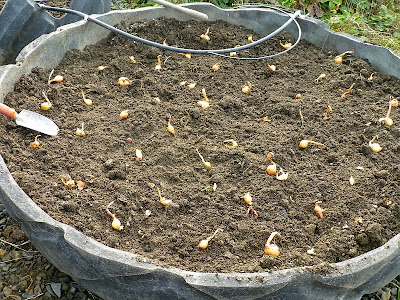 I laid out the onions in advance to determine how many beds I'd need. They took 2 1/2 beds, so I spread things out to fill all three beds. 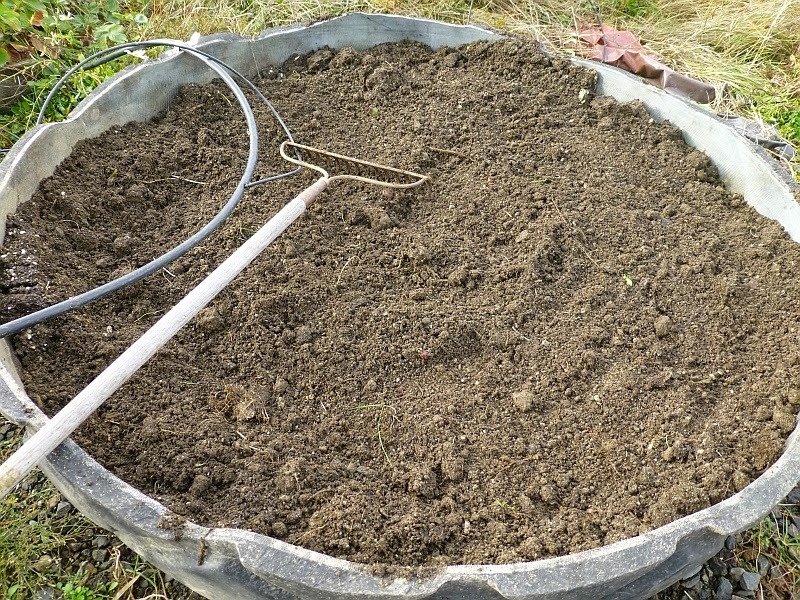 I planted every last clove with the aid of a trowel. It just took a few minutes per bed. Then it was time to mulch. We have an old bale of bluegrass straw that I use for mulching. It's pretty compact, so I rip it up and fluff it before adding to the beds. I laid on the mulch fairly thick, with the understanding that I'll be removing it in the spring. And that, apparently, is that. If these onions produce as promised, I can see them being a long-term addition to the garden. I cannot even begin to thank John for bringing these to my attention! I'm jazzed! My empty 'tater boxes just got their winter duty assignment! Potato Onions are great! I'm glad you found them and very kind of John to send you some. I would also check out Egyptian Walking Onions and Japanese Bunching Onions. Does this look like what you received from John? Similar, but the ones I planted are yellow, not white. John and I are also on the hunt for reds. If anyone finds them, let me know. Thanks for mentioning the name of the company. I was reading about these just last week. I'll be interested in how yours do! Ohhhh! Can't wait to see what happens. I would be interested in those too. 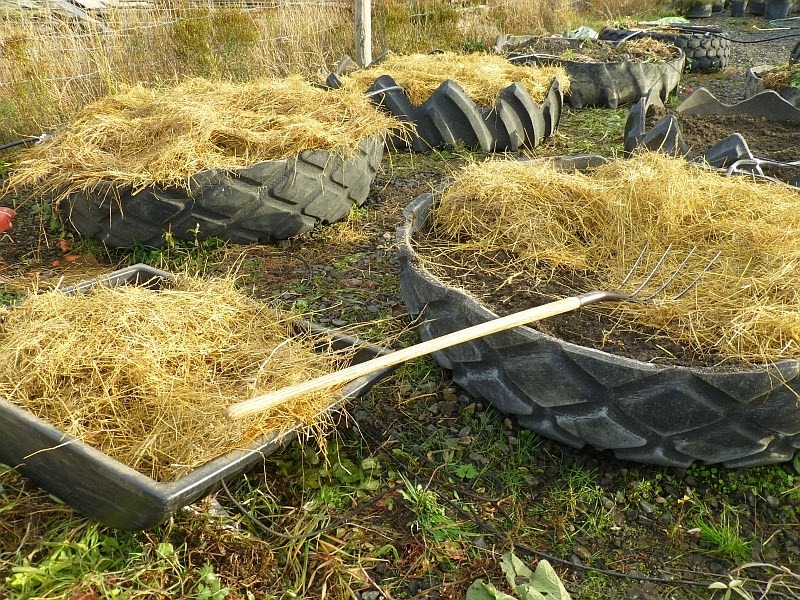 What a joyful harvest from your enterprising tire garden. 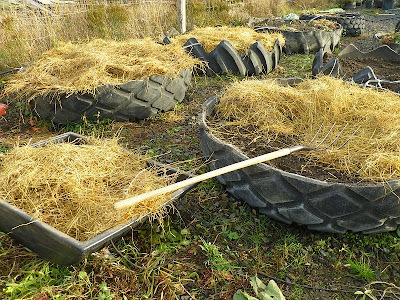 The art of raised bed gardening (without the expensive lumber). A suggestion: I was wondering perhaps if how you put your tire garden together, the necessary materials, etc, feeding and watering, etc., if all that information might be put together onto a single page (that might meander someday into your book), and made available as a highlighted link here on your site--to put it all together for us would be emulators (versus having to wade through the CMS to find all the proper links) that would be awesome! And lastly, to add a link to your header image so that the reader may return to your home page in one click of an instant? The reason I mention it is because anyone who has tried gardening knows that good results can be difficult to find the right balance to achieve. Seems to me you got some pretty good results! 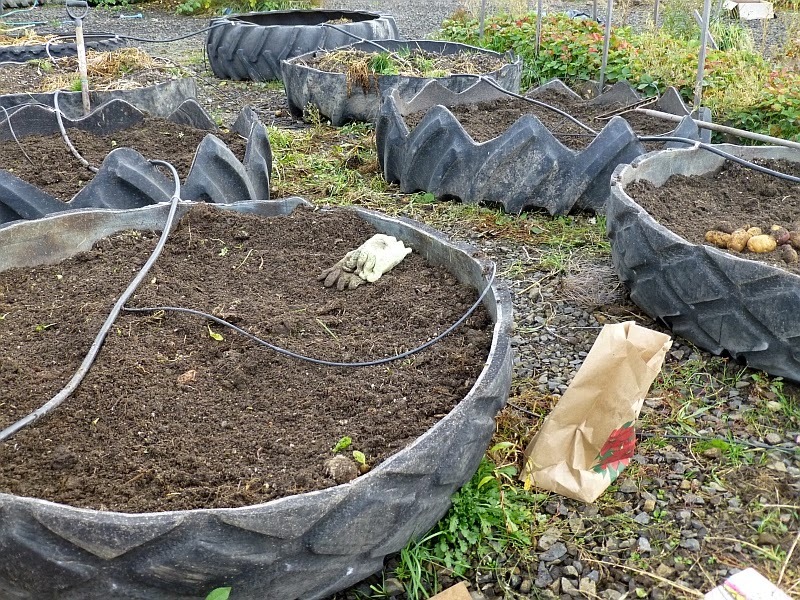 My next article (destined for one of the spring issues) for Backwoods Home Magazine will be a comprehensive summary of the tire garden and its development. I plan to expand that article (once it's written and submitted) into an inexpensive ebooklet such as those offered at www.selfsufficiencyseries.com. In other words, stand by! Could this be a start to another home business? 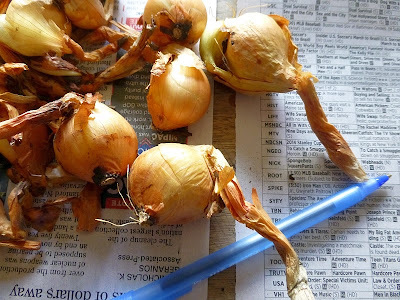 Supplying onions to your faithful readers? 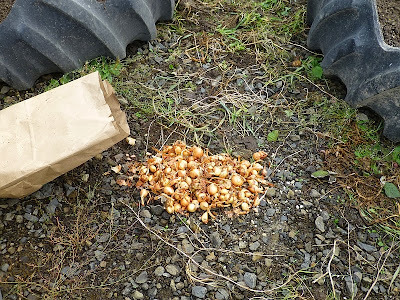 It is funny that you should mention potato onions in this post. I finally got my hands on a copy of Foxfire 4 (for a penny!) and was reading through it after it arrived yesterday. 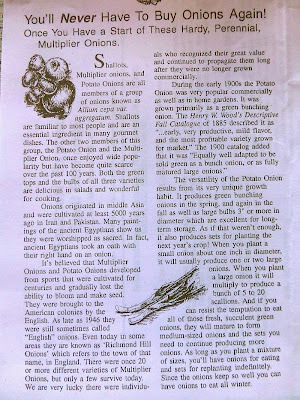 One of the "old timers" interviewed recalls planting onions which perfectly fit the description of potato onions. Then I happen to read your post in the same day...such coincidences! We will definitely try this variety next planting. If anyone knows of a low cost supplier ,or has a couple extra, let me know. Although we planted our multiplier onions in the spring like other onions.